Big eyes or small, chunky nose or no nose at all, 2 pairs of hands and hands that look like feet… all is possible with the Monster Maker. 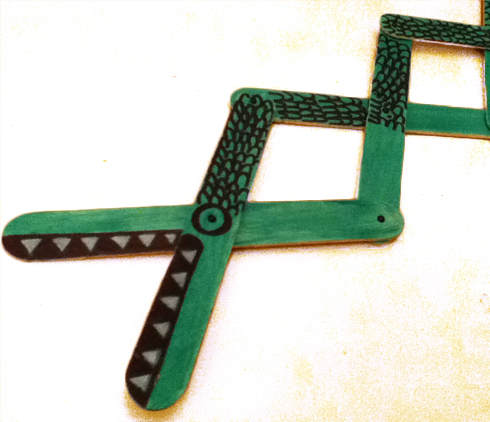 It will take you around an hour an a half to make a 30 tile Monster Maker. _Coloured pencils, markers or crayons. 1. 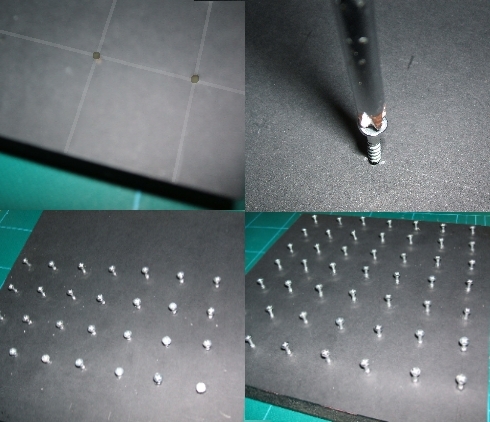 Make a 6×5 grid on the board. Each square of the grid should be 5x5cm. 2. Cut all the tiles out. 3. Draw a circle with a smaller circle inside in 2 of the tiles. This is your first pair of eyes. 4. 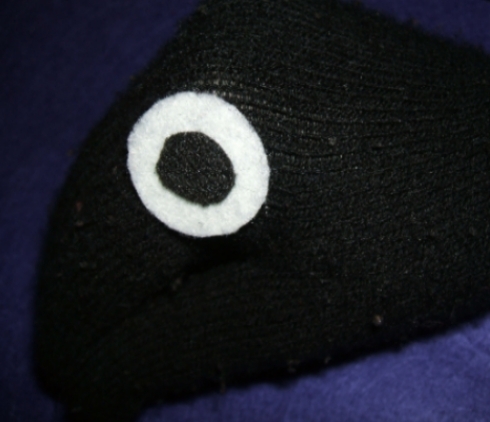 Make a few more pairs of eyes. Maybe some look like alien or frogs eyes or just like X’s. The idea is to have a good range so that you can make all sorts of combinations. 6. When you have all your range of body parts add colour. 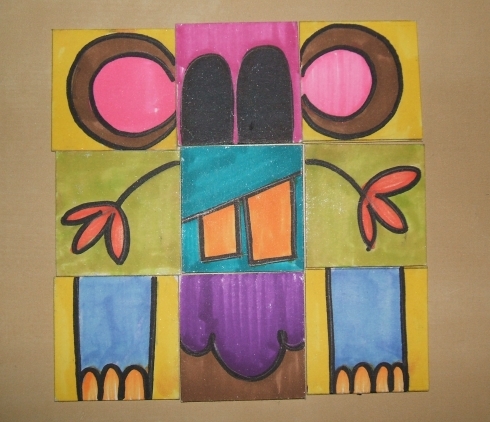 Try to use bright colours and colour the full tiles, that is including the background. 7. 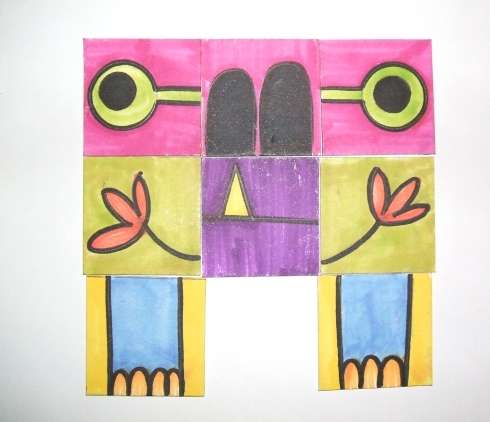 Draw over all the edges with your felt tip pen to define the shapes and make the colours stand out. That’s it! 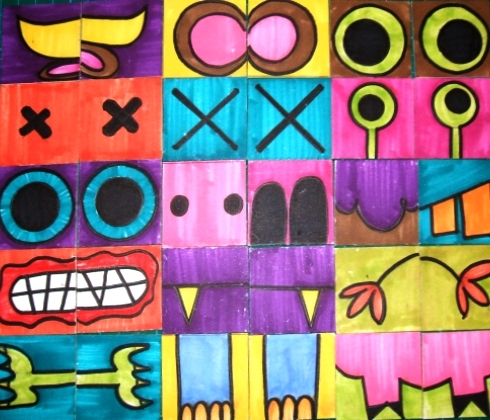 Now you have 30 tiles to mix and match and make all sorts of monsters. 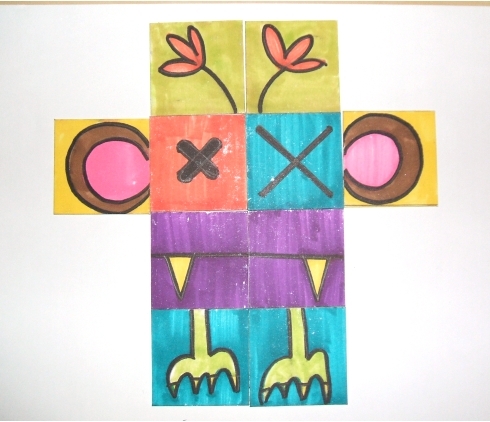 You can make scary monsters and friendly monsters. 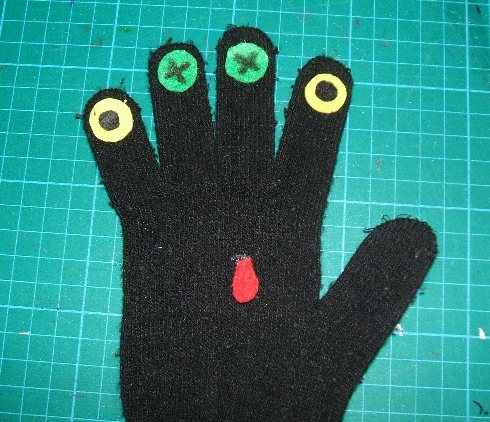 See how you can mix the eyes and make a pair of hands look like antennae? 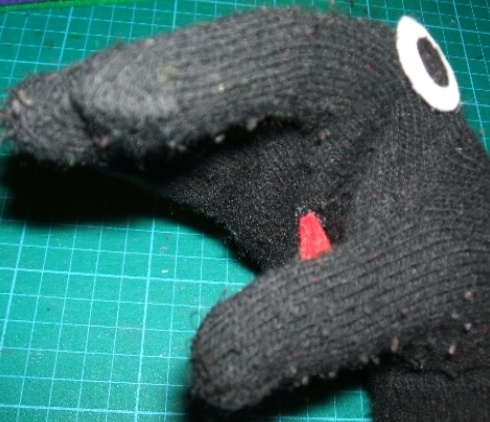 and make a piggy nose look like eyes? …and even ones that forgot to wear their pants! 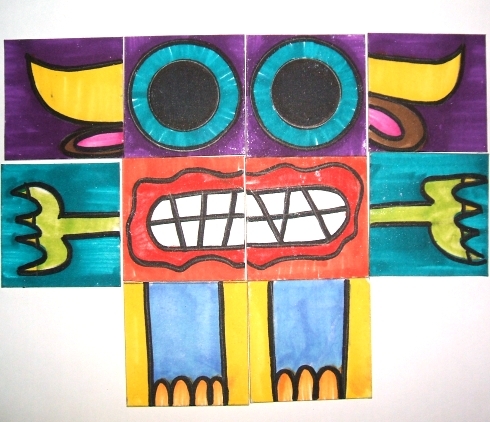 You can make lots and lots of monsters with this Monster Maker and even more if you decide to make more tiles. Use your imagination and have fun! 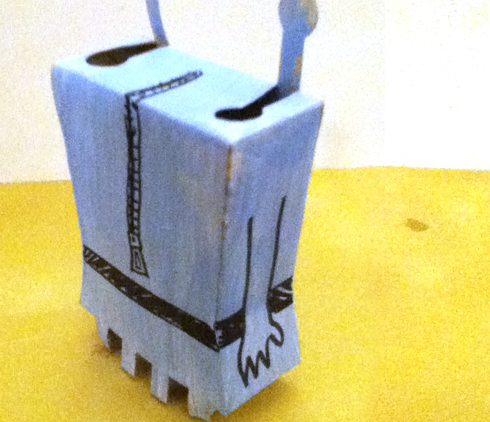 The Cardboard Rocking Horsey is made out of 5 identical modules. It will take you about 45min-1hour to make each module. This is a challenging one so make sure to make it with the help of a grown up. 2. 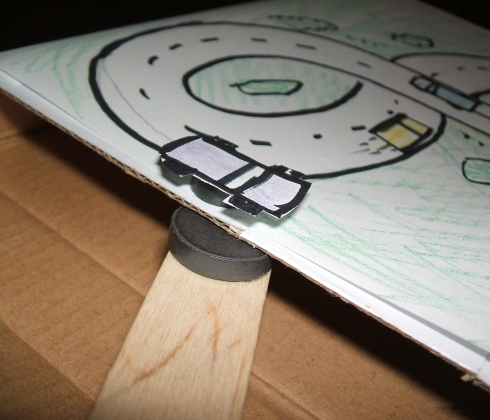 Stick each print on each cardboard sheet using the glue stick. 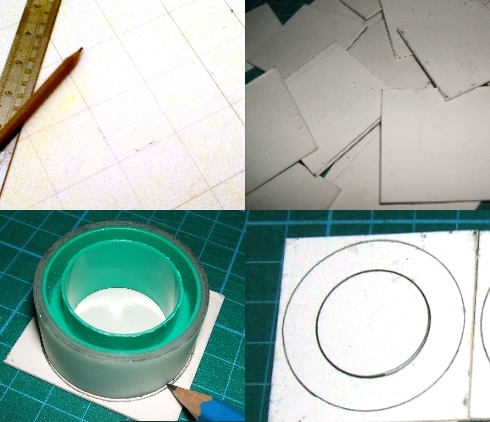 Don’t use to much glue, you want to be able to remove the paper once you’ve cut and folded everything. It’s a good idea to put glue only where there are printed lines. 3. Cut over the solid lines and score over the dotted ones. This will make it easy to fold the sides. 4. Put double sided tape on all the tabs. Don’t remove all the waxed film at once. 5. Close each module by sticking all the tabs to the edges. You’ll have 5 “pizza slices” when you finish. 6. 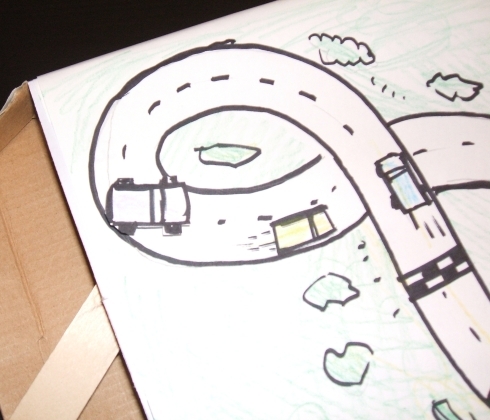 Remove all the paper off the cardboard and put the double sided tape where the drawing indicates with green. 7. 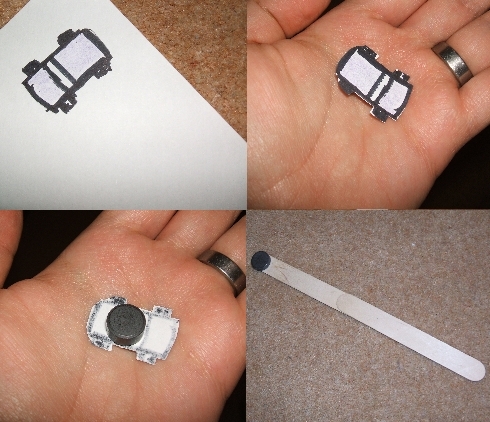 Remove the waxed film from the double sided tape, one module at a time and stick the modules together. Well done! You’ve made your own horsey! You can use markers and poster paint to add details if you like… It could be a spotted horsey or maybe a stripy one? Some say electric cars are the future, but what about magnetic ones? 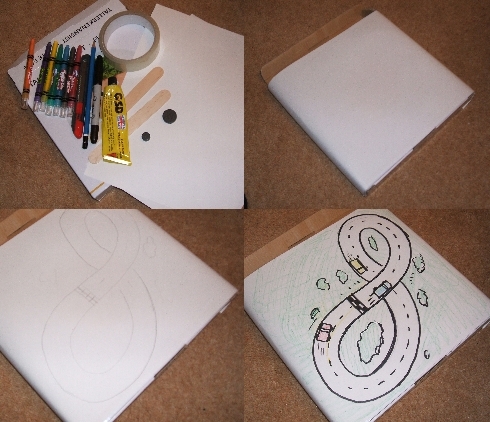 It will take you about half an hour to make a magnetic racing track with a racing car. _2 wooden sticks (lolly sticks) or one long flat stick. You could also use a ruler or something similar. 2. Draw the track in pencil. You can add some details like trees and other cars. 3. 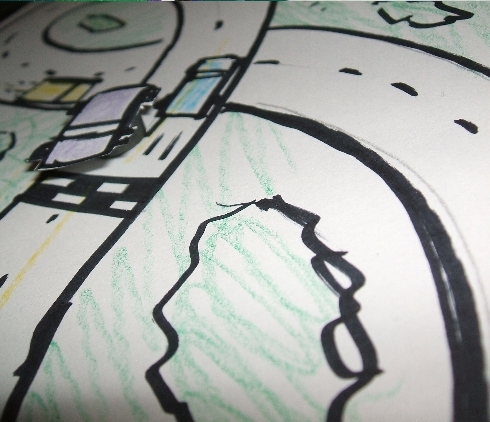 When you are sure about your drawing trace over the pencil with the felt tip pen and add colour. 4. 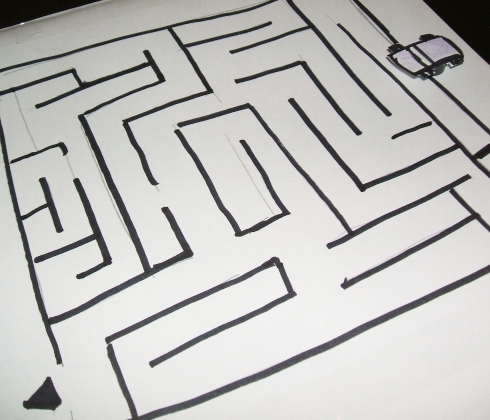 On a separate piece of paper draw a car as if you were looking at it from the top. 5. Cut it out and stick one of the magnets on the back. 6. 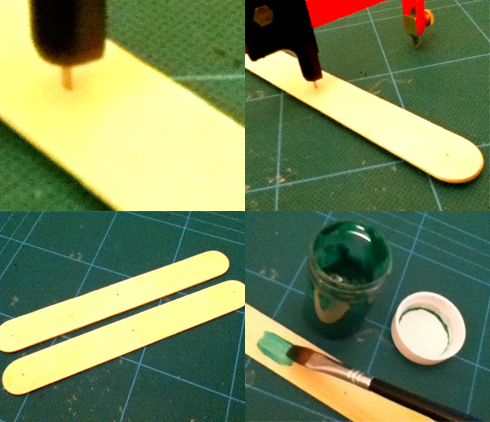 Glue the 2 sticks together to make one long stick and glue the remaining magnet on one end. 7. Put the car on the track and the stick and magnet inside the box to move the car around. There you go… Car that races without you touching it! Think of other things you could make using this idea… what about a horse race track or a theatre set… a magnetic maze perhaps? Really quick and easy, this one will take you about 30 min. to make. 1. 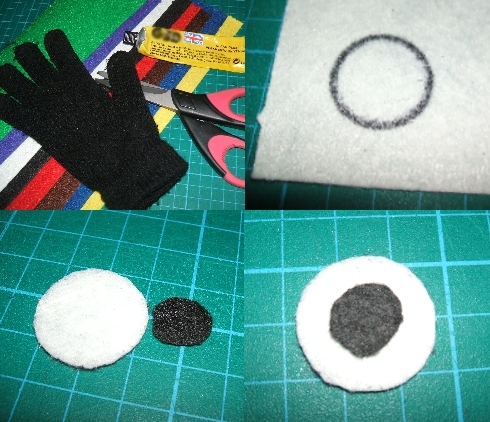 Cut a couple of felt circles, a bigger one, about 2cm in diameter in white, and a smaller one in black. 2. Stick the black circle on the white one to make an eye. 3. Put the glove on. 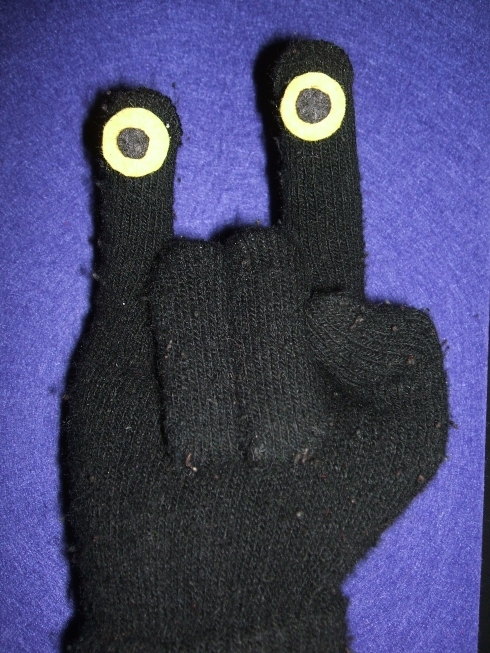 Put your 4 fingers and thumb together as if to make a mouth and stick the eye on the side of your index knuckle. 4. 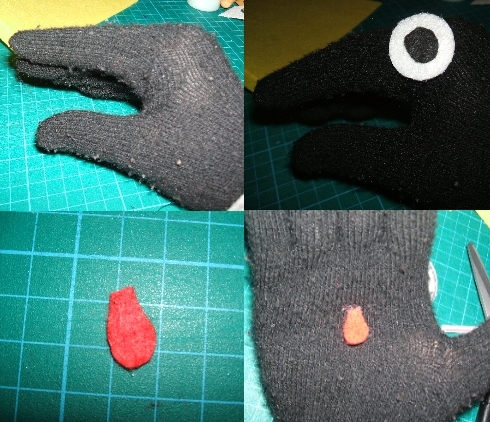 Cut a little drop like shape on red felt and stick it in the middle of your hand to resemble the puppet´s uvula. 5. 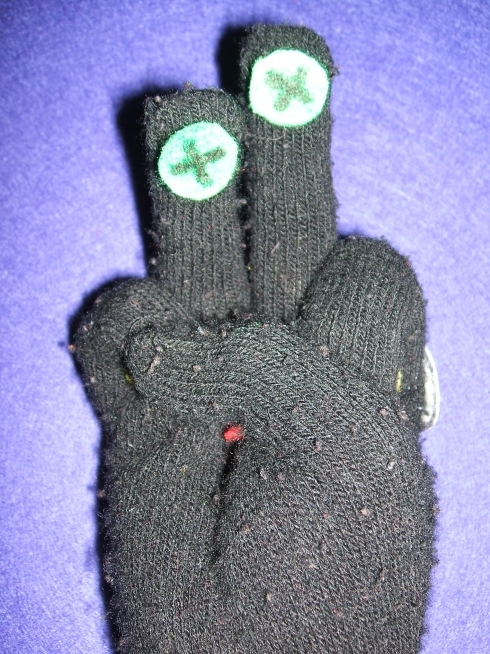 Cut more eyes in different colours and shapes and stick them on the other fingers of the glove. Leave the thumb clear. 6. Now arrange your hand in any position you like to see a different personality of Glover appear. That´s it!… Take good care of Glover and all his personalities. 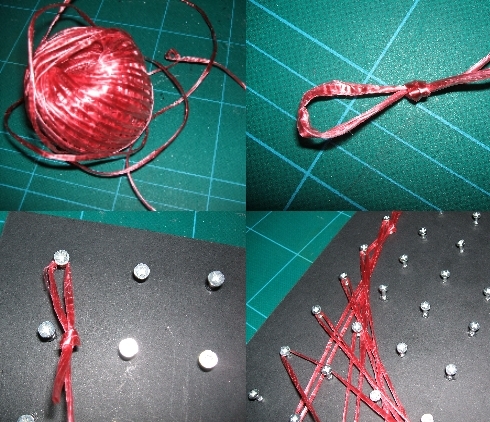 If paper and coloured pencils are not your thing, why not try Screws and String?! This one takes about 3 hours. 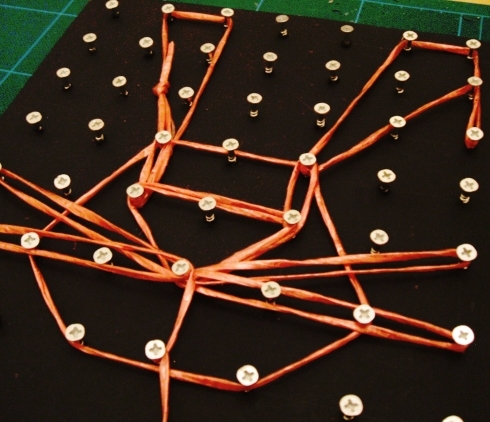 This one is kind of challenging and I recommend that you make it with the help of a grown up. 1. Paint the board black and let it dry completely. 2. Make an 8×8 grid. 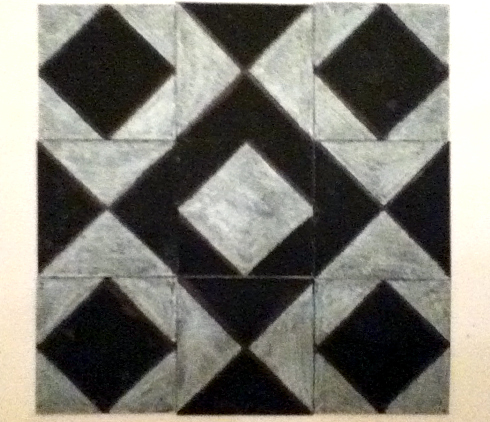 Each square in the grid should be 2.5×2.5 cm. 4. To make it easier to screw the screws, make a small hole on each intersection with the nail and hammer. A couple of hits should be enough. 5. Now put a screw on each intersection. Leave about 5mm sticking out of the board. You’ll have 49 screws total. 6. Now get the yarn and make a hoop on one end. 7. 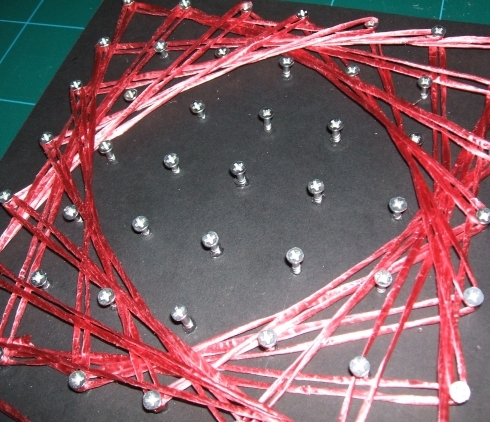 Put the hoop into one screw and go from screw to screw to make some great string shapes! 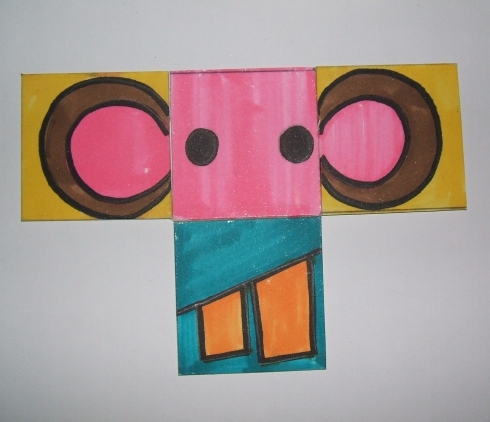 Or your favorite animals… how about an elephant? You can even practice your abc’s! Don’t believe those who claim to have seen alien life forms… this Radioactive Space Invaders are the real thing! 1. Download and print the file above. If your printer can take card, you can print directly on it; otherwise, print on a regular sheet of paper and stick the print on the card. 2. Using your cutter or scalpel, cut the edges of the print. The dotted lines on the drawing indicate where you’re supposed to score, that is pass the knife a few times without cutting all the way through. 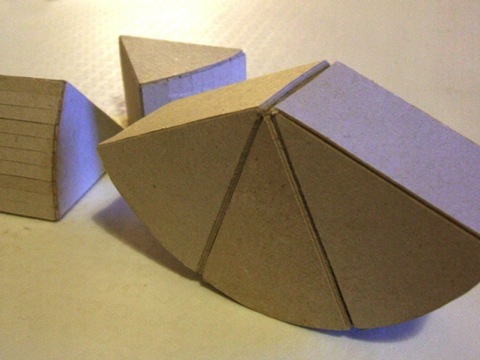 This will make it easier to fold all the sides to put your Space Invader together. 3. 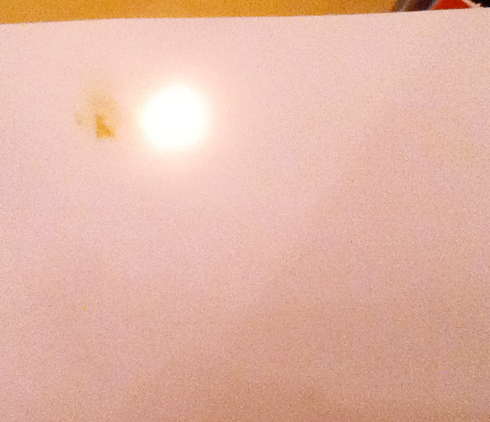 Fold the card over the dotted lines and glue it together using UHU glue. Let the glue dry for a couple of minutes so that the Space Invader is sturdy enough for you to handle it. 4. 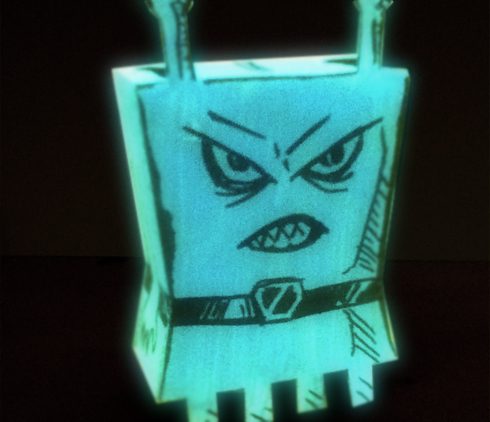 Paint the whole thing with the glow in the dark paint. Let it dry. (Drying time varies depending on the paint you got; read the instructions on the label of your paint). 5. When the paint has dried up, use your pencil to draw a face and any details you like. 6. 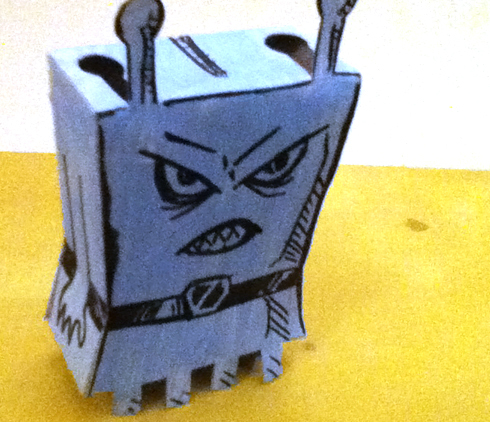 When you are happy with your Space Invader, draw over the pencil with the fine liner or felt tip pen. And that’s it! Turn the lights off and watch your Radioactive Space invader glow. 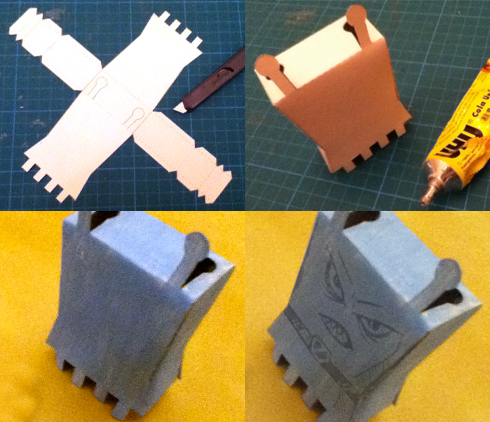 If you’d like to see more detailed instructions on how to fold the space invader or if you’d like to download a slightly different character check this post. Make lot’s of space invaders and hang them on string to make a Radioactive mobile… you could also draw a spaceship and paint it with glow in the dark paint and have a whole Radioactive fleet… what else can you do? Use your imagination and have lots of Radioactive fun. It’ll take you about 45 minutes to make a Lolly stick character. _Something pointy to punch holes through the sticks, it could be the point of a compass or a sharp needle. 1. Grab 2 sticks and using the point of a compass or a needle, punch a hole on both ends of each stick and another one in the middle. 2. Punch a hole in the middle and on one end of of the remaining 4 sticks. 3. 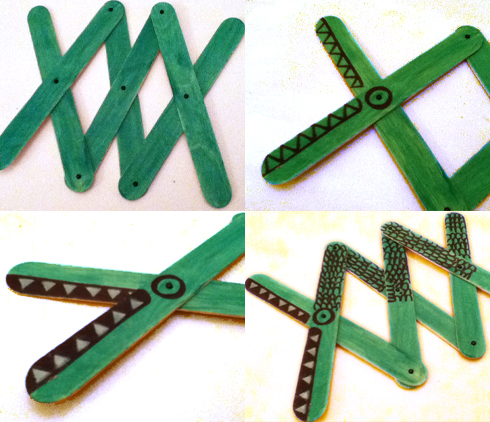 When all the sticks are punched, paint them in green. Let them dry for a little while. 4. 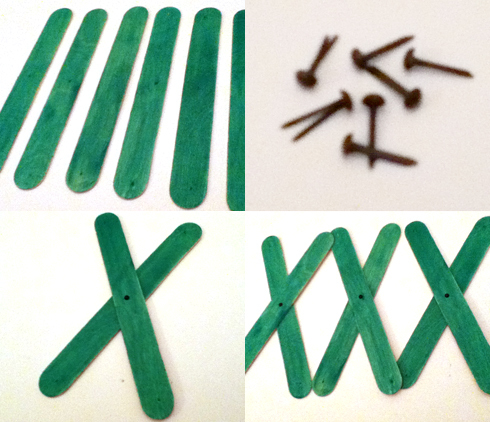 When the sticks are dry, get the brads and join pairs of sticks through the middle. 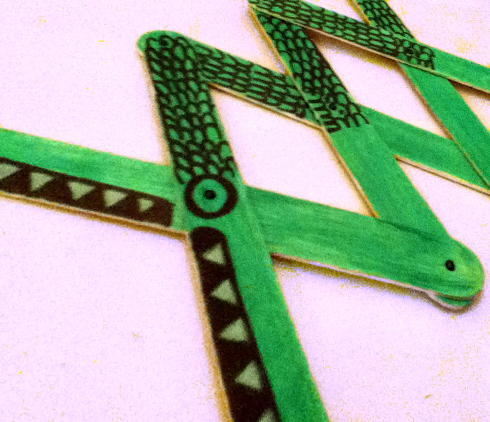 Make sure to join the sticks with 3 holes together; the ones with two holes should have the holes on the same side. You’ll have 3 X’s as shown below. 5. Now join the 3 X’s together using the remaining brads. You should now be able to make the whole thing longer and shorter by opening and closing the 2 sticks in one end, as if they were scissors. 6. 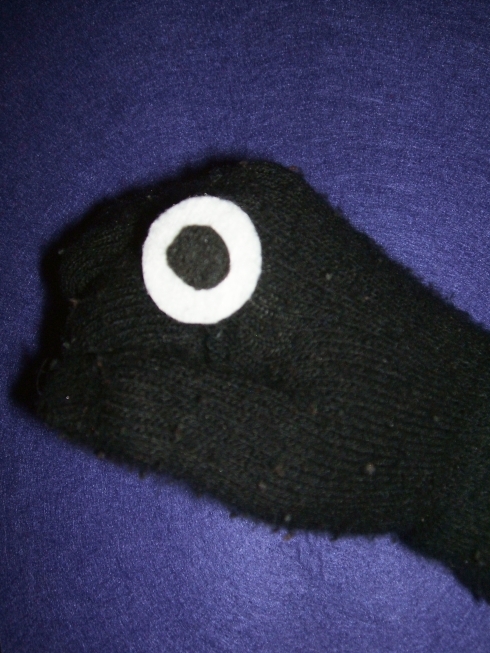 Using your black felt tip pen draw a circle around the brad on one end to make the eye. 7. Draw a mouth and teeth too. 8. Colour the teeth with the white/silver colour and add other details like scales on the back of the crocodile. That’s it! 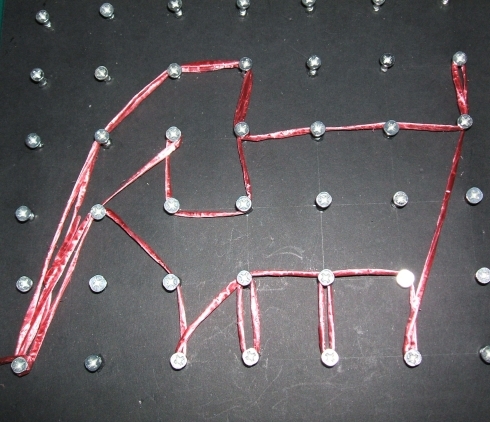 a Crocodile made out of lolly sticks. Now you can open and close it very quickly to make it take big bites! You could follow the same instructions and use different colours to make other animals. What about a duck, or a jumpy fish?! 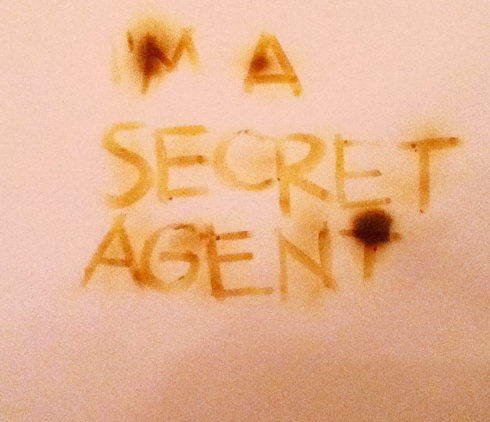 Ever wondered how spies and secret agents make secret messages? 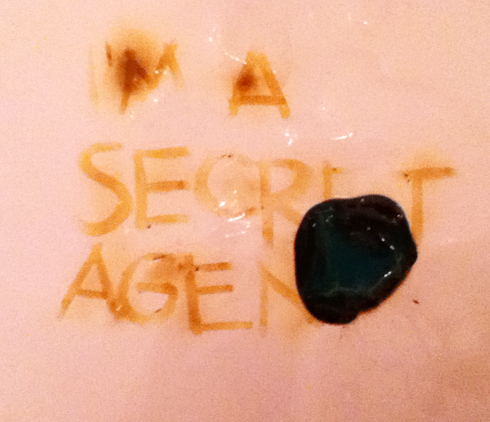 WARNING: It is really quick and easy to make secret messages, however in order to make secret ink work you need fire, so this toy requires adult supervision. 1. 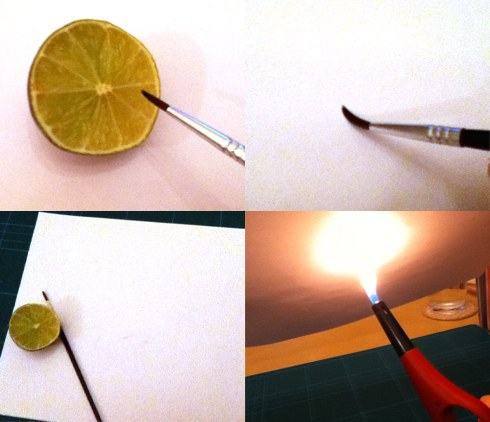 Dip the tip of your brush into the lime. You can also squeeze the juice out of the lime into a container and dip the brush into the container. 2. 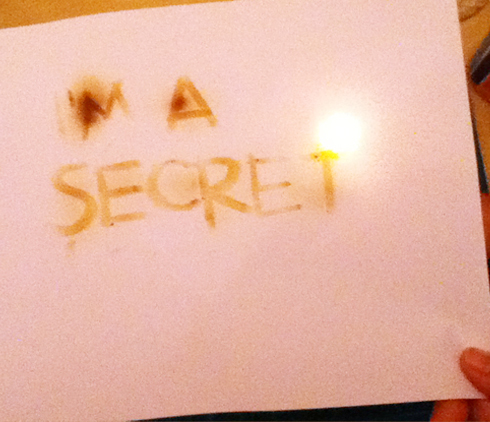 Write your message onto a blank piece of paper. 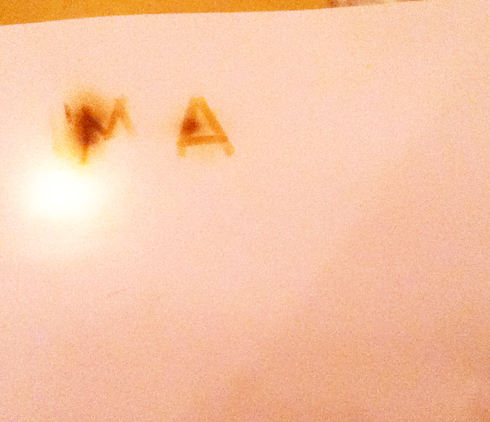 You’ll need to get more invisible ink (lime juice) every letter or two. 3. Let the lime dry for a few seconds. Your piece of paper will look as if it had nothing on it. 4. 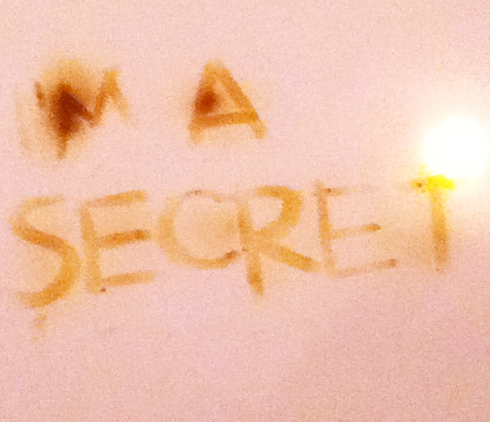 To reveal the message, get an adult to pass the flame of a lighter gently under the paper, all the way through your secret message. Watch letter by letter appear in front of your eyes! Think twice next time you find a blank piece of paper! If you like shapes, patterns and puzzles keep reading.. this one’s for you. 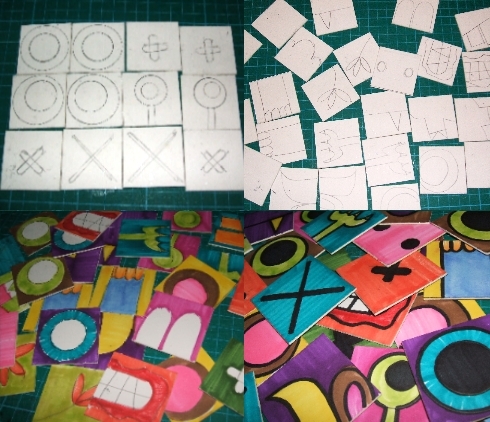 It will take you about 2 hours to make a 49 tile set of Pattern Puzzles. 2. Cut all the squares. I’ll call them tiles from now on. 3. 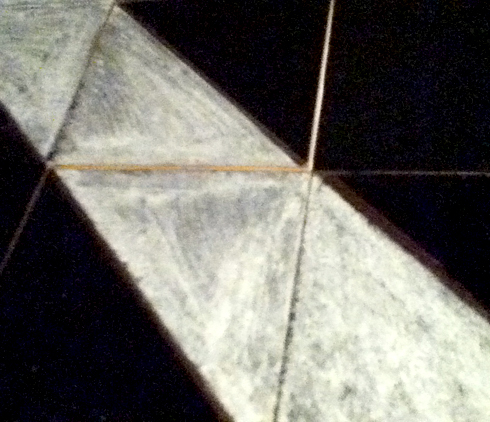 Using your pencil and ruler, draw a diagonal line on one of the tiles from one corner to the opposite one. 4. Draw an X on another one by making two diagonals. 5. 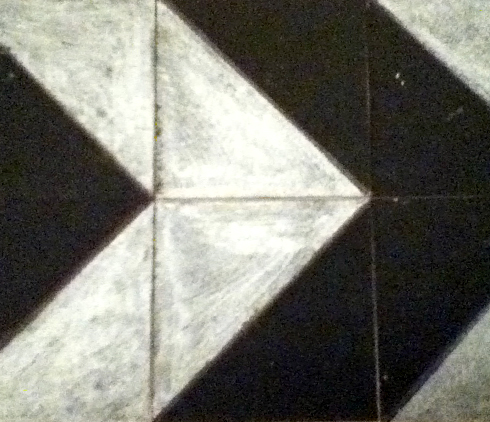 Get a third tile and draw a smaller square inside it, rotated 45°. 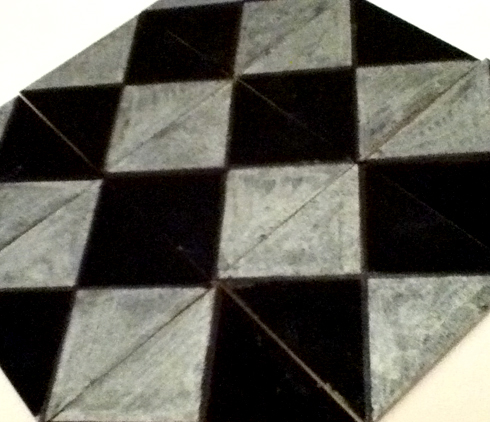 To do this, find the middle of each side of the tile and then connect those points with a straight line. 6. 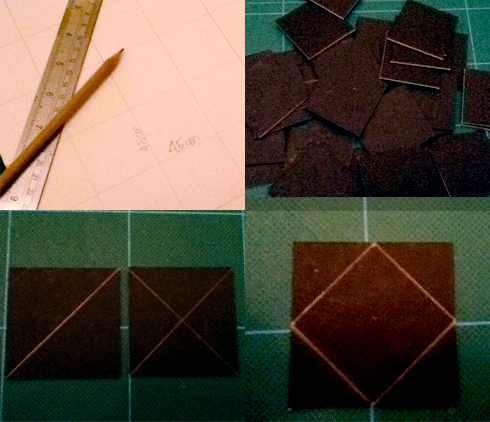 Repeat step 5 to make another tile with an inner square so that you have 4 tiles: one with a diagonal, one with an X and 2 with an inner square. 7. 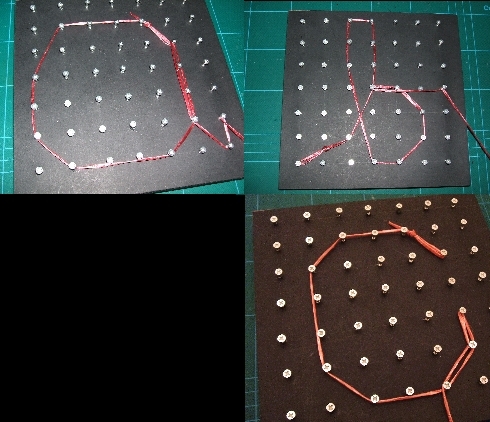 With your metallic pen, colour each of the tiles as shown below. 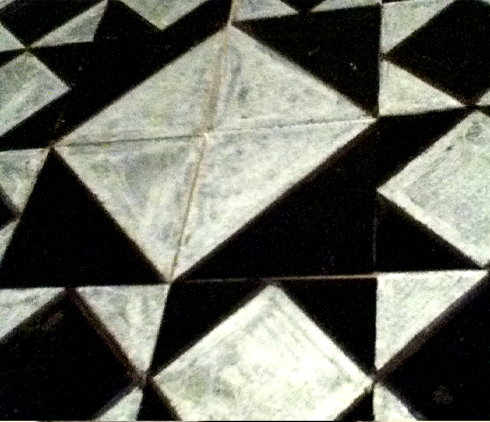 You’ll have 4 kinds of tiles: one that is half metallic-half black; one with the sides of the X in black and the top and bottom in a metallic colour; one with a black square and 4 metallic triangles surrounding it; and one with a metallic square and 4 black triangles surrounding it. 8. 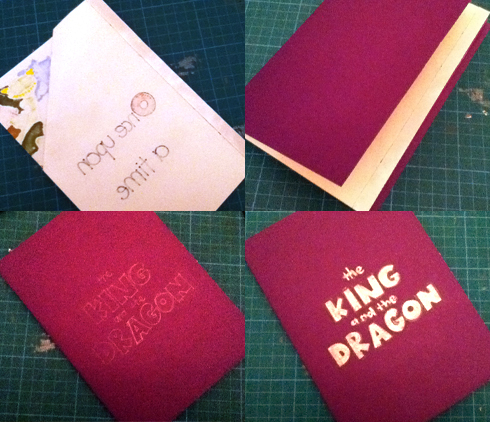 All the edges look a bit rough now, so use your felt tip pen and ruler to trace over all the edges again. 9. 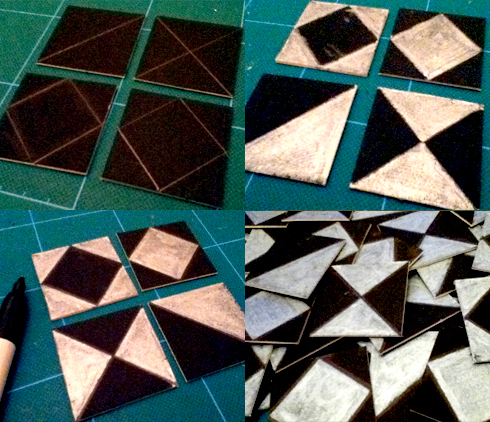 Repeat steps 3 to 8 until you have 11 tiles of each kind and 5 all- black tiles. That’s it! 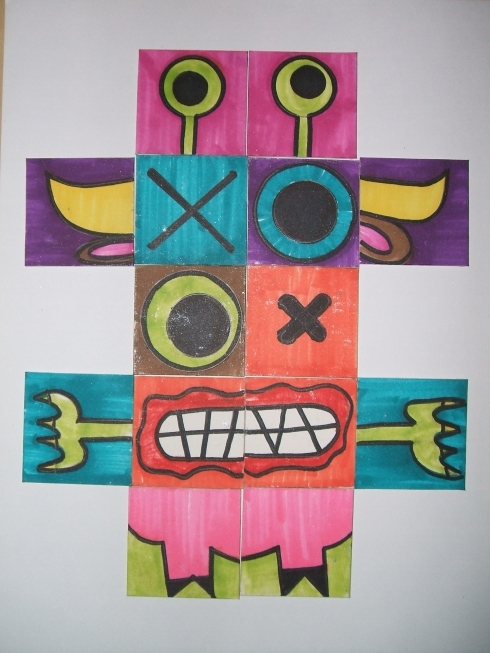 Now arrange all the squares in different ways to create all sorts of patterns. Can you make arrows and straight lines? Have lots of patterned fun! 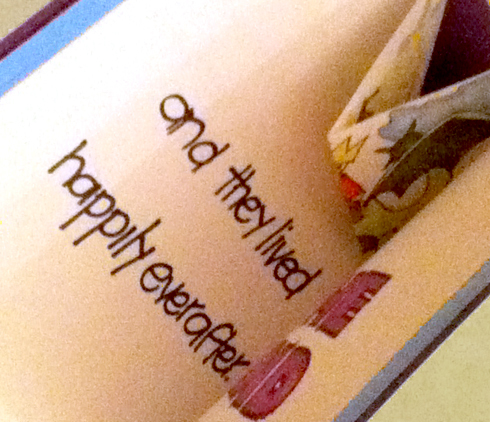 Once upon a time in a far away land, I learned how to make a pop up book… keep reading to learn how to make your own and live happily ever after. It will take you around 2.5-3 hours, depending on how long a story you decide to turn into a pop up book. 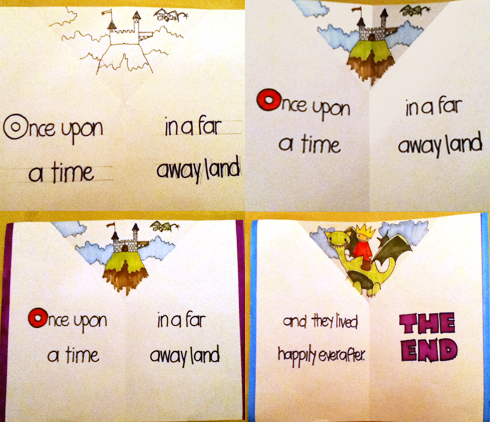 _A good story to turn into a pop up book. You can choose one you already know or make one up yourself. Either way, it’s best if you go for one that isn’t too long. Remember you’ll have to write and illustrate the whole thing! 1. 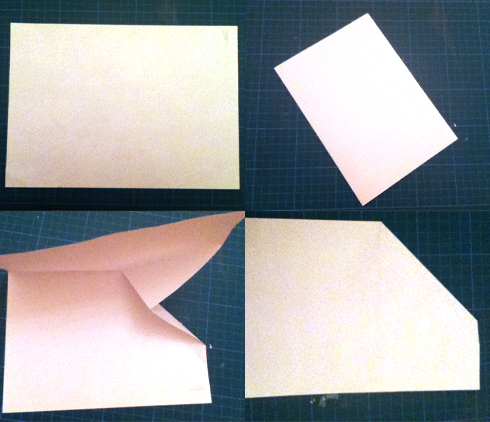 Grab an A4 piece of paper and fold it in half. 2. Open it a little and fold the right end inwards, 9o°, as shown in the photos below. 3. 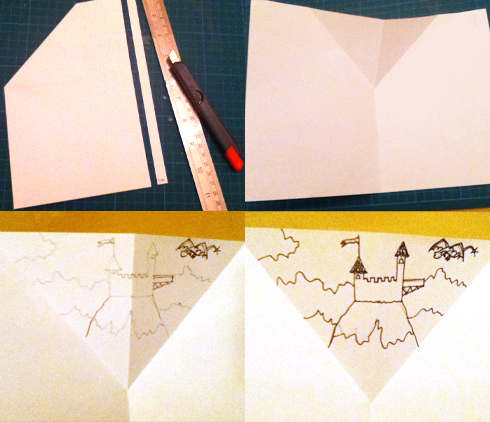 Draw a vertical line 1cm from the edge of the folded paper and cut over the line. Make sure that you cut both halves. 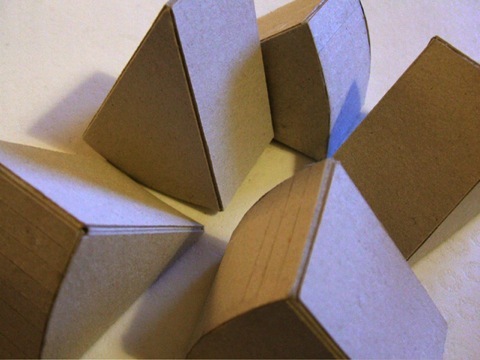 When you open the paper again, the 2 triangles that formed with the folding will be the pop up bit of your book; the rest of the page will be where you’ll write your story. This will make the first spread of your book (spread = facing pages). 4. 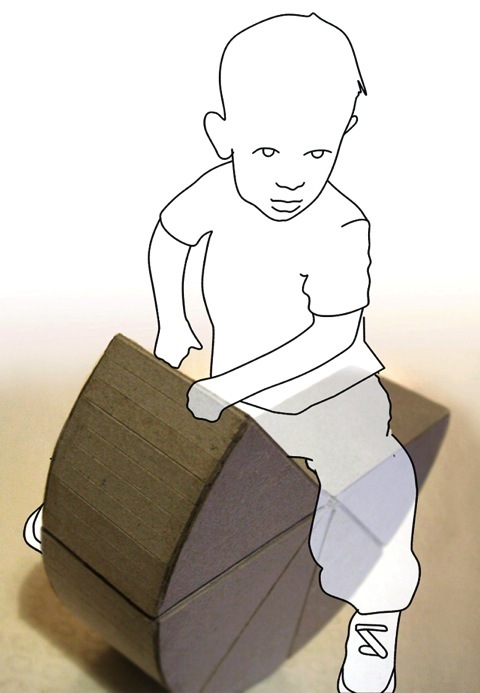 On the pop up bit make a drawing that illustrates the beginning of your story. 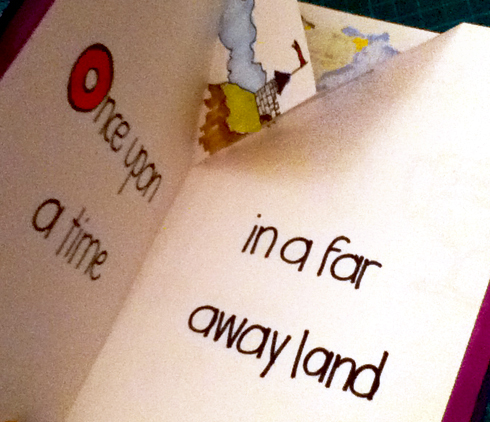 I’ll start with the usual “Once upon a time in a far away land” so my illustration is of that “far away land”. 5. When you are happy with your illustration use your fine liner to trace over the edges. 6. Using your pencil, draw a few horizontal lines, the same distance from each other, on both pages of the spread (left and right halves of the folded A4). 7. Write in pencil the beginning lines of your story over the lines you just drew. 8. When you’re happy with the text, use your black felt tip pen to write over the pencil. 9. Add colour to the illustration and any details and decorations to your piece of paper and that’s your first spread done. 10. Do the same with as many pieces of paper as you need to write and illustrate your whole story. 11. Put a strip of double-sided tape on the back of the right page of each spread. 12. 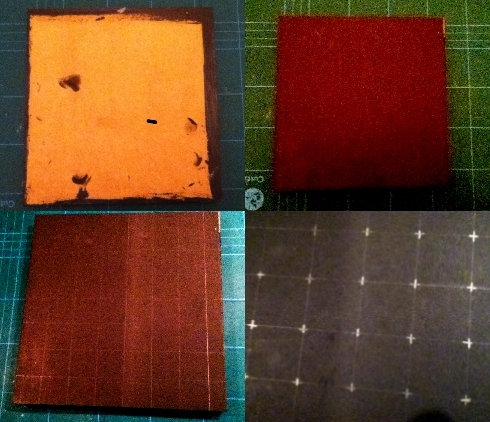 Remove the waxed film from the tape of spread 1 and stick the back of the left page of spread 2 to it. 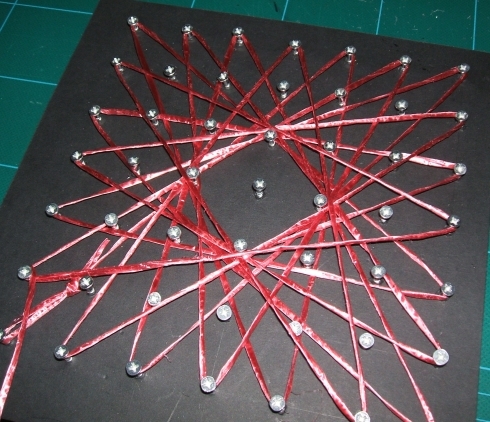 Try to align the edges of both spreads as much as you can. 13. Repeat step 12 until you’ve put all the spreads together. When you finish, you’ll have some sort of concertina. You’ll now be able to flick the pages and see the illustrations pop up as you do so. 14. 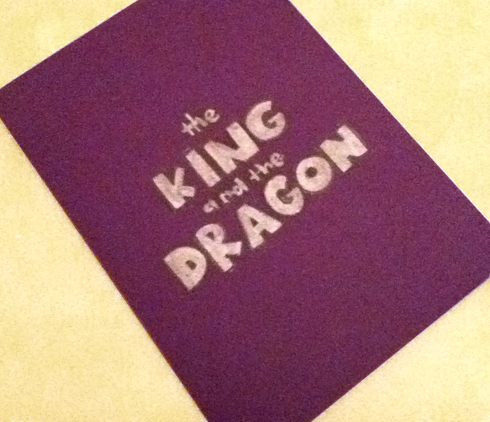 Add a stip of double sided tape to the back edges of the first and last pages. Don’t remove the film yet. 15. 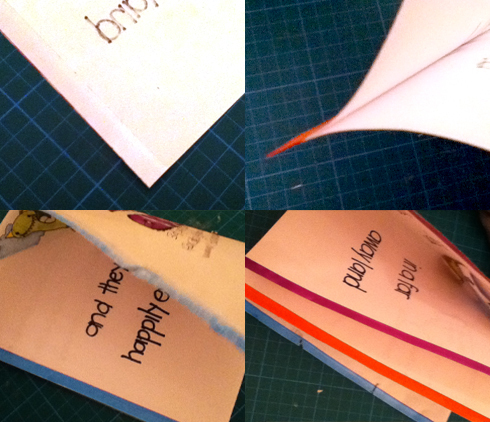 Fold the A4 card in half and put all the pages inside. Make sure they go all the way to the back. 16. Remove the waxed film from the front page and press the card onto it. Turn the book around and do the same with the back. You should now have a fully functional pop up book. 17. Write the title of you book on the cover, make another illustration if you like, and when you’re happy with it use your liner or felt tip pen to trace over the edges. 18. Add colour and you’re done! 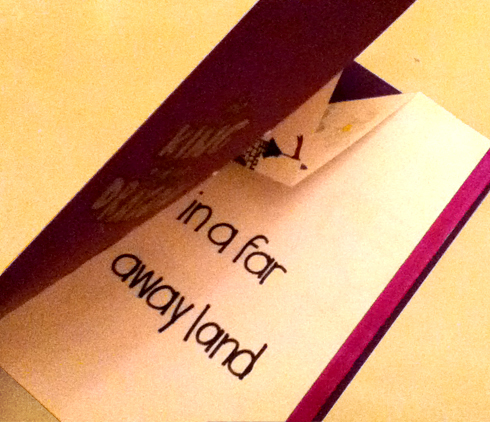 There you go.. your own pop up book.